It’s hard to believe it’s been 20 years since both the Arizona Diamondbacks and Tampa Bay Rays (or Devil Rays as they were then known) entered the league. Last night, both teams celebrated their 20th anniversaries (March 31, 1998) with throwback games and there were some interesting parallels to both teams approaches. On March 31, 1998, with Andy Benes on the mound, Jorge Fabregas behind the plate and Mike Lansing in the box, the #Dbacks officially made their @MLB debut. There are more videos, of course, but those two were the best. The 1998 throwbacks were pretty spot on to the originals, with the exception of the anniversary patches on the cap and sleeves. Back in 1998 (and still, today) I never liked the uniform. I was amazed at how many people seemed to love it (and many of those were probably actually alive back then). I always thought it was, I donno, just NOT a real baseball uniform. I never liked the gradient or the font, and the cap with the ray was, well, different. But I give the team credit for trying to think out of the box. Considering where we are in baseball fashion today, they’ve actually aged fairly well. The team nailed the throwback pretty well and even had special throwback helmets (or at least decals) created for the game, which was a nice touch. The squad looked pretty good. 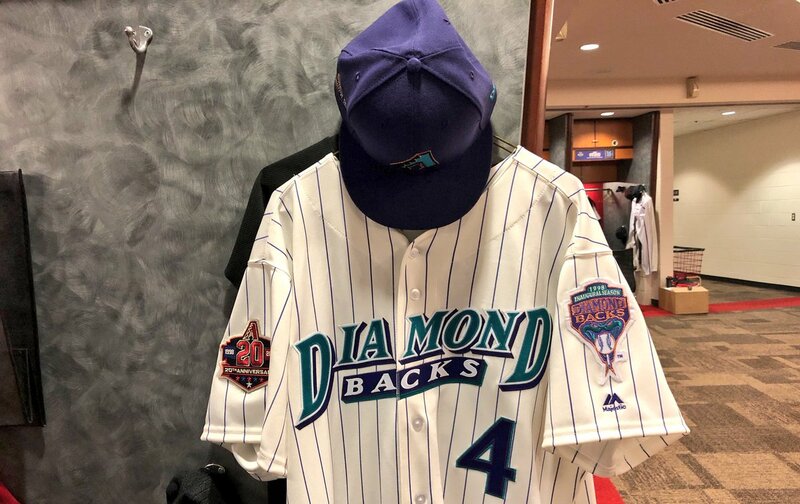 For their part, the Diamondbacks also wore (one of their) original 1998 uniforms, opting to wear the purple cap — this was the combination they wore on March 31, 1998, so it was a true throwback. It came complete with a patch designating the first game in D-backs history. Like the Rays, the Diamondbacks did a nice job with the reproduction. 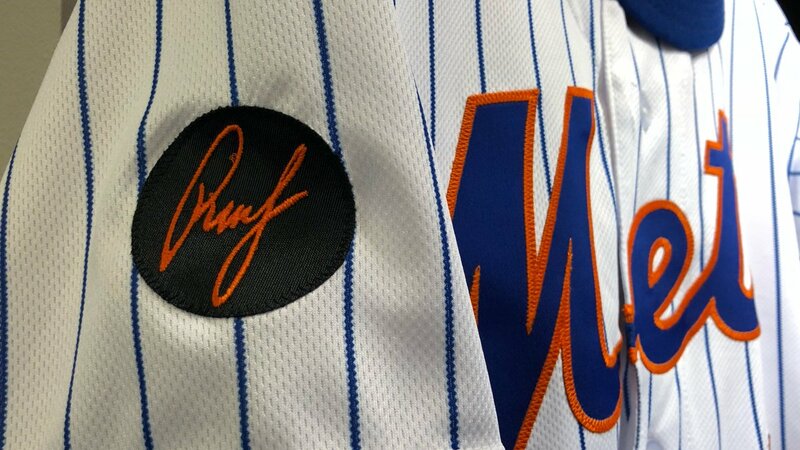 They, too, wore a special patch designating their 20th anniversary on the right sleeve. Nice job by both teams. The fans really enjoyed both games, even though both home teams lost. It was fun to see the unis once again (and it won’t be the last time for either — although the Diamondbacks will be throwing back six times this year, this will be the only original 1998 uniform; the Rays will wear these again). Purple, teal, gradient — all products of the 1990s — are back, if only for a few glimpses. Maybe they’ll grow on me with time, but right now, let’s be glad the colors and styles are just for throwback games. With the NCAA’s 68 team tournament now down to just two teams, I’m back with the original (and still the best) Jimmer Vilk, who will give us one of his famous “5 & 1’s” (only this time it’s a double-stacked 10 & 2) — as he has done for umpteen straight years, Jimmer is back this year with his roundup for the top ten, two bad, and two honorable mention uniforms for the NCAA Tournament. Enjoy it folks. This is more than likely Mr. Vilk’s FINAL list of any kind on Uni Watch. For my final Shining Moment I wanted to get as many schools in as possible, so there will be no repeaters as I sometimes had in the past. It made for some tough choices. including one Phil’s not going to like. Didn’t do it on purpose, buddy. Here’s Luther to get you in the mood. Ready? Let’s do this. At least the Sooners’ BFBS trim and swoosh make the important stuff stand out more. So long, Russell Athletic…I’m going to miss you! The Gaels’ uniform mesmerizes me. I would’ve picked this matchup even if it didn’t end in legendary fashion. Glad to see the Ramblers’ script going DEEP into the tourney! Kentucky is the Croatian soccer team of NCAA basketball and that’s a good thing. Phil REALLY wanted A&M/Michigan instead, but even in maize I don’t like how the Wolverines look these days. The second of three Swoosh vs, Swoosh games I actually like. This beat Duke/Kansas because I liked the Hall’s script and double blue better. Question: What’s worse than BFBS vs tiny printing? Answer: Low-contrast BFBS vs. *irritatingly* tiny printing. For reasons not worth getting into (and I honestly don’t even know them all myself), this will be Jim’s final list on Uni Watch. He’ll still be contributing in other ways to the blog, so we haven’t gotten rid of him just yet ;), but enjoy the last one from the original…and still the best…Jim Vilk. Since the Devil Rays and Diamondbacks both threw back to their original uniforms last evening, I asked Ron if he could crank up the way-back machine and grace us with some photos and information for games played much earlier than 1998 (the inaugural year for Tampa Bay and Arizona) for those two locales. He didn’t disappoint. This waterfront ballpark was built in 1947 and is located just over a mile from where Tropicana Field sits today. It was named in honor of Al Lang, the former mayor of St Petersburg. Lang’s work was instrumental in bringing MLB baseball in the form of spring training, not just to this city, but the state of Florida. Earning him the moniker “Father of Spring Training”. The first game at the new ballpark was played in 1947 as the Cardinals beat the Yankees. The highlight of the game was a Stan Musial home run, the first at the new ballpark. Over the next 60 years the ballpark was home to at least six teams, including the Yankees, Cardinals and Giants. In 2008 the 7,227-seat ballpark would host it’s final spring training game and then would be transformed into a soccer stadium for the USL Tampa Bay Rowdies. A St. Louis Cardinals player’s spiked foot coming out of sliding pit during spring training drill at Al Lang Field in St. Petersburg, Fla., on March 5, 1955. Built in 1909 for the town miners and their families, the Warren Ballpark is still around today making it one of the oldest active ballparks in the country. And it wasn’t long after it was opened that it began to host games between town teams and on November 7, 1913, the New York Giants and the Chicago White Sox were the first big league teams to play a game there, Jim Thorpe would hit a memorable home run as his Giants routed the Sox 9-1. Over the years several minor league teams called it home as well as the Bisbee High School Pumas, who started playing their football and baseball games at the complex and still do today. NFL News: Gone but never forgotten: Ignacio Salazar spotted this old truck complete with vintage Houston Oilers logos around Houston yesterday. … Some neat vintage finds from Chris Pajewski: an AFC and an NFC lunch box (or is it lunchboxes — not sure if it’s two separate ones of the flip side on one). … “Jamal Adams posted this picture of himself wearing a throwback Kelly Green Jets uniform,” writes Greg Kissler. “I know the Eagles get all the love when it comes to kelly green uniforms, but come on, the Jets were just as nice.” … (Cross posted in NCAA Hoops as well): Yesterday, Tom Brady posted this edited picture on his IG of him on the Michigan Wolverines Basketball team. No Jordan Brand, NCAA and Big Ten Logos (from Martin). Hockey News: The Vegas Golden Knights are less than one season old and already they’re retiring a number. But it’s not what you think. They’re retiring #58 and last night raised a banner with 58 stars to honor victims of Oct. 1 mass shooting (from Steve Sher). Here’s some video of the ceremony (from James Gilbert). NBA News: The Grand Rapids Drive had a player, Zeke Upshaw, collapse during the final minute of last weekend’s game. He died a couple days later. 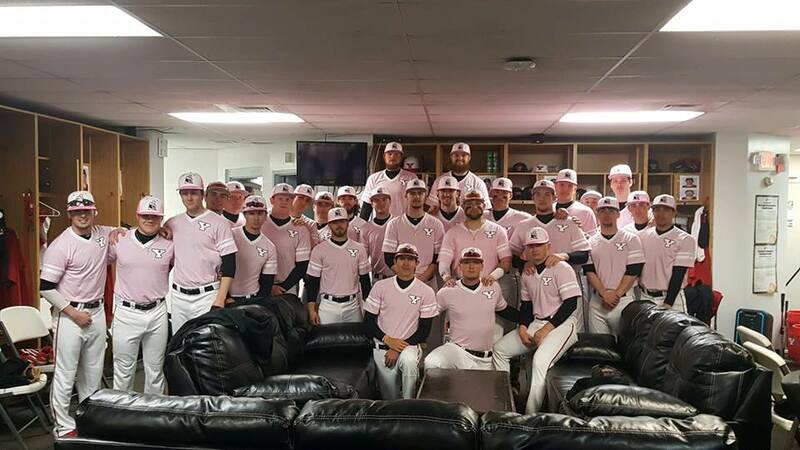 On Friday night, the team wore a patch in their only playoff game in his memory (from John Chapman). … In addition to the NFL lunch box found above by Chris Pajewski, he also found these vintage Pete Maravich kicks, in McKinney Texas. … If Conrad Burry’s reporting is correct, the Orlando Magic will wear their classic blue pinstripe unis next season. College Hoops News: (Cross posted in NFL section as well): Yesterday, Tom Brady posted this edited picture on his IG of him on the Michigan Wolverines Basketball team. No Jordan Brand, NCAA and Big Ten Logos (from Martin). Soccer News: The following three items are all from Josh Hinton: (1) Here’s a good article on USL club names. … (2) The Sky Bet Championship, the 2nd tier of English soccer, put out this tweet that noted how tight the race for the playoffs were (3rd-6th make playoffs, 1st and 2nd automatically promote to the Premier League). (3) However, the image they used for the standings uses the wrong Brentford logo. This is the correct logo. 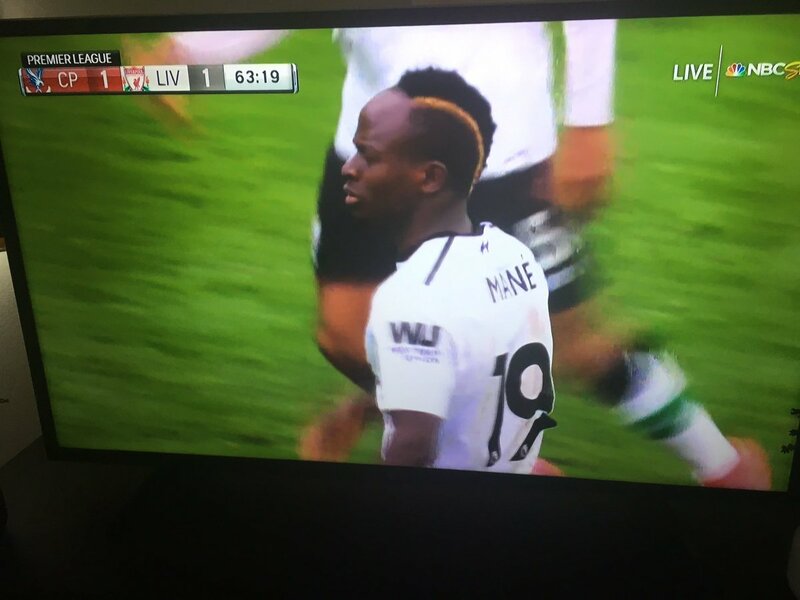 … Yesterday there was a number malfunction for Liverpool’s Sadio Mané (from BandaBear). … In yesterday’s match, Paris Saint-Germain wore golden NOB and numbers during the french league cup final once again (they did it in ‘16 and ‘17 as well). From Florian McGill. Grab Bag: When your equipment gets stolen, you make do: “We’re lining up against the Roosters in our Heritage jersey tonight due to the theft of our away jerseys and equipment.” (from Jonny Foreigner). … Syracuse lax has some interesting sleeveless jerseys (from @EBrooksUncut). Happy Easter to all who are celebrating today. Are those Tampa Bay caps really authentic? I thought that 98 team had black caps, not blue. Yesterday’s caps looked like the same blue they use now. Maybe I’m wrong, I never saw them in person, only on 1998 televisions. But to me the blue caps looked anachronistic. The original hat was black. This new navy blue retro cap is supposed to be a blending the old and new design. On a day when the Rays had no competition from the Lightning, one of their top draws in town with Boston, and the 1998 anniversary promotion, Tampa Bay drew only 17,838 fans. Correct. The team’s uniforms for the first few years had black hats. The logo was also a TB, also with a gradient, with the swimming stingray below. Regardless of how you feel about the whole uniform, it was a pretty solid hat, and it was distinct. 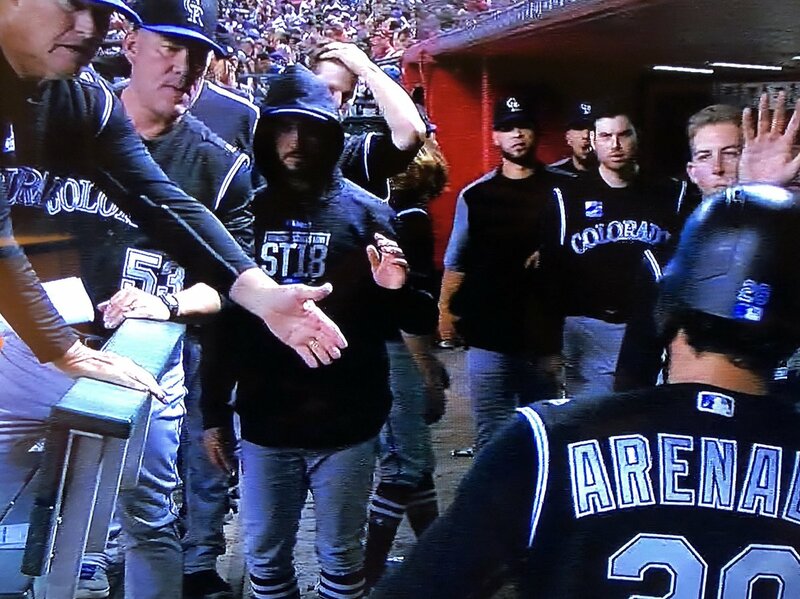 For these throwbacks they just put the clunky ray-only logo on the current color hat, probably in an attempt to sell more hats by blending it with the current uniform. They should’ve gone with the true throwback as that hat looked much better. Also, the original Rays through 2007 had “Tampa Bay” on the road uniforms, as it should be. That’s been gone since 2008, and it bothers a lot of people around here who feel local pride. If they get a new stadium here, one of the conditions of using any public money should be a return of Tampa Bay to the road uniform. Not sure if this was an alternate, or if they moved to the TB after the first year? Totally agree about “Tampa Bay”. Every team should have city name on their away jerseys. For my money their early 2000s green sets were their best. The blue caps are anachronistic – the 98 Devil Rays wore black. But the blue caps are also a huuuuuuge upgrade. Makes all the difference between the originals, which were a dated-in-their-time near miss, and a beautiful throwback uniform. Oh, I agree, I like this blue. Really makes the yellow highlights pop nicely. I always love the Jim Vilk uniform rankings. I like the Clemson-Auburn selection because I love orange. And the Iona uniforms are weirdly cool. And I like the UMBC uniforms, except for the script, and that leads me to my next comment. But I don’t get the fascination with the Loyola script (I’ve seen other people also make positive comments about the script). First, it’s too small. Second, it looks like the cheapest font the local sporting good stores down the street had for youth league uniforms. UMBC’s script has the same feel, even if those scripts are completely different. I love the Loyola story, and I rooted for them all the way. The color scheme is great, but I’m not a fan of the script. I always love the Jim Vilk uniform rankings. OK, some of the rest of the comment finally sunk in. Yes, the script is too small, but small script is better than no script. And at least it was bigger than Michigan’s micro-block lettering. I’ve heard of Al Lang Field but never knew it was that close to the water. Interesting aerial photo; for a venue built in 1947 there are several vintage vehicles (Model T’s?) parked along the street. That first photo appears to be of Waterfront Park, Al Lang Field’s predecessor. Waterfront Park was demolished and a new grandstand built further inside it to create the new field in 1947. Compare the two here. Thanks Robert, I am not surprised that someone in the Uni Watch community would have the explanation. In those days they made cars – and ballparks – to last. While Trevor Bauer is the only active Indians starting pitcher to go with the road grays, DL’d starter Danny Salazar is the only member of the Tribe staff to opt for the navy jersey/red block C cap at home. 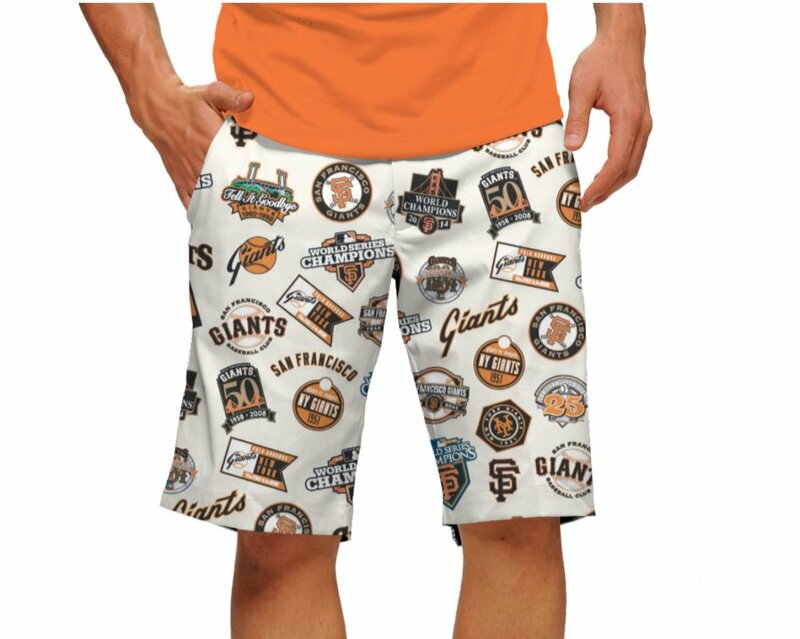 Any link between Salazar’s injury history & his lack of fashion sense is purely coincidental. That terrific NFL lunch box taught me something! I noticed it has both Seattle and Tampa Bay, but they are shown in the “wrong” conferences. I never knew that Seattle was initially assigned to the NFC West and Tampa Bay to the AFC West in their inaugural 1976 seasons, and the teams had a special schedule where they’d play every team in their conference once, then each other. In ’77 they flipped conferences and did the same thing. That way the new teams could play all other teams in the league over their first two seasons. In 1978 they assumed their regular schedules. COTD For Stan stirring the plain helmet pot! A lot wrong with that Jamal Adams Jets fauxback; no need to get into them here. I think I’d like to see the 1978-89 unis as a throwback, if and when the NFL rescinds the stupid one-shell rule. But they are in no way superior to what they have now, or what they had prior to 1978. My preference for the Jets is the present uniform, just lightening the green to a kelly green. Like the pre-1978. Jets kelly green < Eagles kelly green look. The Eagles paired the green with silver pants. And the silver wings on the helmet beat the futuristic wordmark. You can assume it is one lunch box. Look at the latch. I think Robert is right, that is Waterfront Park and not Al Lang Stadium, I thought the cars looked outdated for 1947. Will have Phil make correction. Thanks for all the contributions, Mr Vilk. 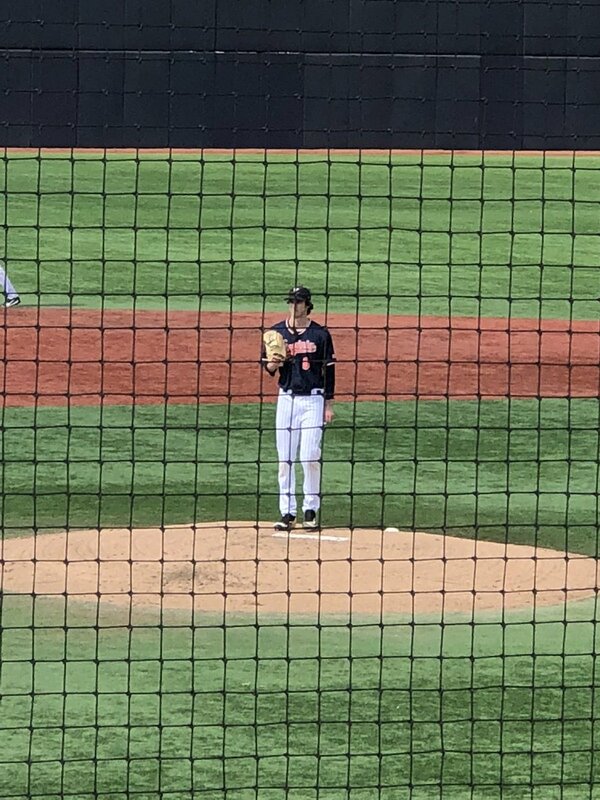 The beauty of UniWatch is to see the pics and then find out that it is truly in the eye of the beholder. I think maybe we’re missing the point. It seems to me Vilk’s strength as a contributor was that he didn’t take us by the hand. He treated us like adults. He respects us enough to forget us. As I always said, these lists weren’t THE authoritative lists…they were my lists. If anyone agreed, great. If not I welcomed their thoughts. Looking forward to seeing someone else’s take next year. The more I see of St. Bonaventure, the more firmly I believe that the Cleveland Browns should drop the orange, entirely. And while I like orange, I wouldn’t mind seeing a concept of your idea. Keep in mind that Bonaventure used to have one of the more over-the-top mascots, not just Indians but BROWN INDIANS. Manny Machado’s shoes look like he borrowed them from Mickey Mouse. Watching the Indians play the Mariners this weekend, their “dark blue” looks almost black. The Vegas Golden Knights retiring No 58 seems a little forced to me. It’s not at all forced for those of us who live here. Obviously the MLB Pastel Colors was a prank, but the whole idea feels so well thought out compared to most of MLB’s holiday garb. Aside from Houston and Minnesota, the color choices for the jerseys work really well. MLB could do, and has done, worse.